Mather Pumps provides jet and irrigation pump service for any sized yard, garden, vineyard, or orchard, whether it be small or large. We can also provide pumps for people who have pastures for horses, and other livestock. No matter what size of an irrigation system you have, we can provide you with the right pump. Commonly used for irrigation, or pressure boosting our jet pumps are sturdier and more powerful than those that are sold in box stores. 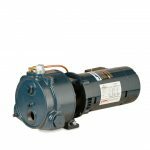 If your irrigation needs require more than what a jet pump can handle, we stock a variety other pumps that can fit your irrigation needs. Just give us a call and we will find and install the one that is right for you.